Sadly, Braveheart went to the rainbow bridge today 9/30/06 duting dental surgery to remoe maloccluded incisors. We loved Brave heart very much and will miss this special little guy very much. He was too young to leave us so soon. Rest in peace little bunny man. Hello. My name is Braveheart. 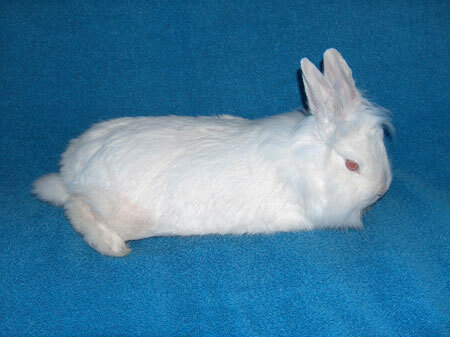 I am a young adult, gentle, exquisitely handsome and soft, neutered lion head rabbit. I am a quiet and sensitive sort of guy who falls very deeply in love with my human guardians. My feelings were hurt before by someone who surrendered me to a shelter, so I might hold back until I know I can trust you to love and care for me. I never want to be abandoned again. I have so much love to give and I am so ready to give it all to the right person. I'm an amazing bunny with a very special and healing way about me, that just can't be described. You'll have to meet me in person to really appreciate how special I am. The reason I am a special needs rabbit is that I have a malocclusion with my teeth, which means they do not meet up. This makes it hard for me to eat or groom myself. The veterinarian recommends that I have all four of my front incisor teeth pulled. I will still have my back teeth, so I'll be able to eat just fine. You would just need to shred larger pieces of food, like a baby carrot. Other than my teeth, I am almost perfect in virtually every way. SaveABunny needs to raise about $500 for my dental surgery, so if you would like to make a donation to help me, we'd all be very grateful. The ability to help rescue special needs bunnies like me really relies on the generosity of people like you. Donations of $50 or more receive free SaveABunny membership and a beautiful color certificate. More importantly, you will know that you have helped to save and improve the lives of loving rabbits, like me, who would otherwise be euthanized. I am a bit lonely and really hope that you will meet me soon. I'm ready to find my forever home and be a loyal, loving bunny for many years to come.